Manchester By the Sea doesn't pull its punches in its portrait of a grief stricken man forced into some semblance of life. It is sparse, it is heartbreaking, and yet uplifting as well. It is a finely crafted portrait of sorrow and a form of redemption. 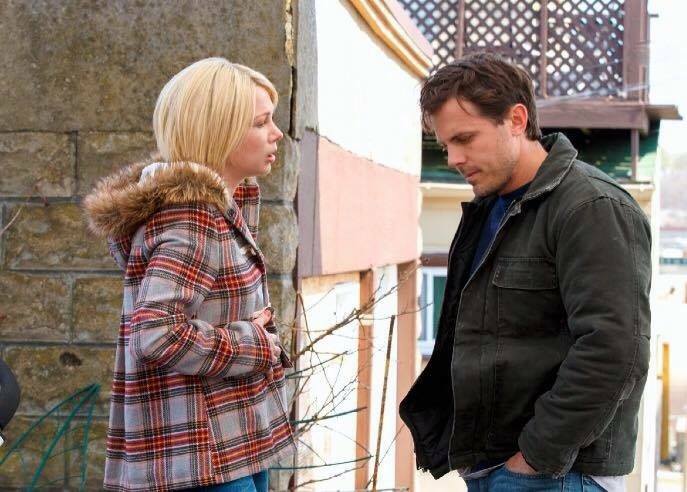 Told in non-linear fashion, where we jump to before and after Manchester By the Sea actually starts, we begin with Lee Chandler (Casey Affleck); he is a plumber/handyman in Boston, removed from the world and disinterested in it. This is a result of a personal tragedy that in various flashbacks is revealed. I won't reveal what it is, suffice it to say the reveals to Lee's life prior to where his life is now gives us who he was and why he is the way he is now. He would be happy (or at least not be displeased, since Lee is never happy) if he never went back to his hometown, but he must. His older brother Joe (Kyle Chandler) has died, his congenital heart failure finally taking him. Lee takes this as he takes anything in his life: matter-of-factly, but with no great grief (all the grief, indeed all emotion, having been sucked out of his life years earlier). Lee now must inform his nephew, Patrick (Lucas Hedges). Patrick is sixteen, on the hockey team, in a band, and has two girlfriends: Sandy (Anna Baryshnikov), his official girlfriend, and Silvie (Kara Hayward) the girl he sleeps with (again, all this is revealed in bits and pieces). Patrick has also been communicating secretly through email with his mother, Elise (Gretchen Mol), whom Lee remembers as being a hopeless lush, horrible person, and the only person whom he can muster the slightest variance of anger towards. Lee is shocked to find that Joe has made him Patrick's guardian. As one sees in flashbacks to that one heartbreaking tragedy in Lee's life that so decimated him, he believes he is not guardian material. However, he can't find a way out of it, and the prospect of staying in Manchester with all its awful memories and his infamy is unbearable. After a while, Lee decides it's best to move away from his memories and his ex-wife, Randi (Michelle Williams), who has remarried and is pregnant. Patrick does not want to move, sell his father's boat, or do anything that would break his life. Lee does not want to live in Manchester and wants to take his nephew to Boston (technically Quincy, but I'm not the best arbiter of Massachusetts geography). Over the winter Lee is forced to live in Manchester (the weather being too cold to allow for Joe's burial), Lee and Patrick attempt to live life at various moments of grief and pain, and in the end, there is a solution to their dilemma, though perhaps not one that audiences might expect. 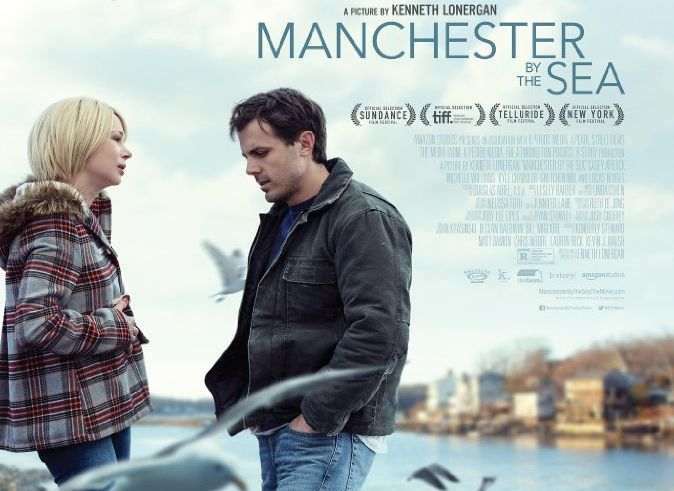 It's difficult to give a strong description of Manchester By the Sea plot-wise because to reveal the center of Lee's emotional agony would be to reveal too much. However, writer/director Kenneth Lonerman made a wise decision to present Lee in medias res, where we see the hard, detached yet forlorn figure he is in the present, and draw us, bit by bit, into his past, where we see him as a regular, blue-collar guy, who liked his beer and his friends, who was happy with his family, his wife, and his children. As we float back where we see glimpses of Lee's life pre-tragedy, we can understand why he shut himself off, why his life went off the rails, and why he may not come fully back. Lee functions, but he does not live, in the present. Lee lives, but he does not function, in the past. Those two elements are what push and pull Lee, and we see how he got where he got. This is all captured in Casey Affleck's brilliant performance. A side note: I've held that with the Affleck Brothers, Casey is the better actor and Ben is the better director. When one tries to do the opposite of where their gifts and talents are (Ben acting, Casey directing), the results are weak to say the least. Yet I digress. Affleck balances that joie de vivre with pre-tragedy Lee and the submerged shell of a man he is post-tragedy. His best scene is when he is interrogated: the matter-of-fact manner building to an unbearable guilt over his actions, the mix of agony, shock, and despair all washing over him, it tears at you. All his reactions in that scene are believable because Lee is a believable character, the type of person you would work with and know: not perfect, but not evil either. 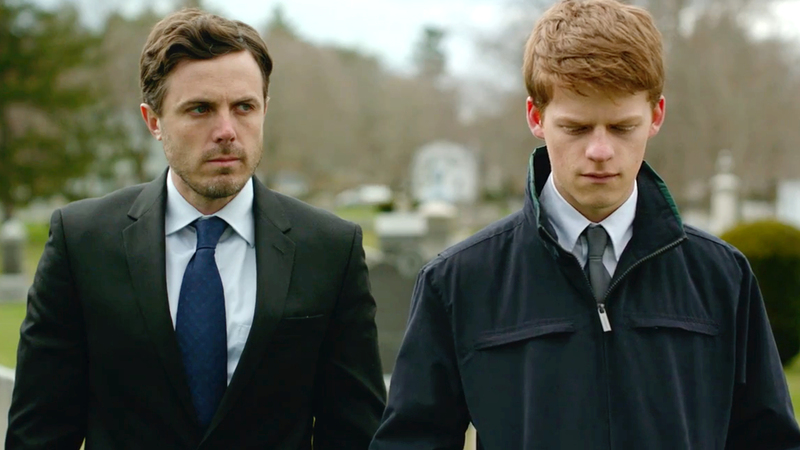 Throughout Manchester By the Sea, Affleck keeps Lee as an authentic man. The film doesn't give him a big moment of epiphany, where he becomes a new/better man and overcomes all. At the end of the film, Lee is pretty much the same person he was when we first met him, but given a slight sense of hope. In Affleck's performance and in Lonerman's script, the character, indeed all the characters, stay true to themselves. Two other extraordinary performances are those of Williams and relative newcomer Hedges. Williams' Randi, like Affleck's Lee, is a regular person: loving but coarse, who must build herself up as well. Though her part is small (relegated mostly to the flashbacks), she has one moment in the present where she runs into Lee and they share an honest conversation, revealing that despite her new child she too has not fully healed, that perhaps she never fully will, and that she still loves Lee. This particular scene together similarly tears at you, and it's a credit to Williams as an actress that she makes it a wonderful and sad moment without making it dramatic or overblown, but natural. Credit also to Lonerman's direction. As Patrick, Hedges, like everyone in the film, is flawed but real: laughing with his friends, attempting to deflower the more religiously-oriented Sandy, processing his desire to hold onto what he has of his life before Joe's death but also reacting to things as they come at him in unexpected ways (meat falling out of the freezer sends Patrick into a bit of a panic attack, having him think of his father Joe in a freezer while waiting to be buried). These are real people, not characters or types. They are flawed, they are sometimes infuriating, something painfully sympathetic. These are people, as played by the actors and written/directed by Lonerman, whom you could know, and that is a major reason why Manchester By the Sea works. Their very ordinary lives, their mistakes, regrets, slight joys and gallows humor gives them an authenticity and relate ability that gives them life. At first, the first flashback threw me off, and I imagine it might throw others off too. While the Elise storyline shows why Lee, as tightly wound-up and dissolved a person he is, might have disdain for her, Patrick's meeting with her and her fiancée (Matthew Broderick) barely touches on Elise's own apparent redemption via religion. I will give it a little leeway in that perhaps Elise was meant to be that important, and thus we can gloss over her own crisis of confidence with Patrick at a very awkward lunch. Still, that part felt a bit out of place to me. That might be the film's only really overwhelming flaw. Another might be that at over two hours, it might be a bit punishing to some viewers. As a portrait of grief and vague hope, of a man who exists but who may not fully bring himself back from among the dead he's buried, Manchester By the Sea is a beautiful and haunting portrait. A strong script and strong performances hold it as a really impactful, intelligent film. Part of me worries that with the descriptions and the plot, people might think Manchester By the Sea is all-misery with no hope whatsoever. That isn't true: there is hope for these characters, and while you may leave a bit sad, you won't leave with a sense of despair and angst. You will leave at peace, a little heartbroken for them, but not without a sense that the Chandlers and those around them can indeed find a way back.